Ericsson (NASDAQ:ERIC) is commercializing the world's first 5G NR radio for massive MIMO, with the first deployments coming in 2017. Together with the Ericsson 5G Plug-Ins announced in June and Ericsson's already commercially available Radio System Baseband 5216, which currently powers Ericsson's award-winning Radio Test Bed, Ericsson is first to deliver all components of a 5G access network. "As we accelerate toward 5G, it's beneficial to have a flexible radio platform that can be deployed not only for LTE, but also versions of future 5G NR standards." 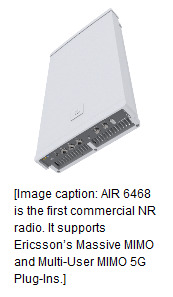 AIR 6468 combines advanced antennas with a large number of steerable ports to enable 5G technologies of beamforming, Massive MIMO and -- building on that -- Multi-user MIMO, initialized as MU-MIMO. These capabilities improve user experience while enhancing the capacity and coverage of the network and reducing interference. The new radio provides LTE support as well, so it is applicable in today's networks. "Massive-MIMO, also known as 3D MIMO, is an important milestone in China Mobile's technology roadmap from 4G to 5G. We are very happy that Ericsson's new radio product is coming to market soon to meet our needs and enable us to integrate 5G technologies into our existing networks." A host of new additions to the Ericsson Radio System are also coming that address key 5G requirements, in today's networks. "On the road to 5G, we will continue to invest in LTE advancements that will become part of our 5G networks. For us, it is key that Ericsson has chosen to focus on advances that will support us in this evolution. These enhancements will further improve the customer experience." "Mobile operators, today, are clearly focused on the race to 5G commercialization, while also continuing to invest in their existing LTE networks. With a new 5G radio and LTE offerings which echo key 5G concepts - small cells, licensed-unlicensed band combinations, Cloud RAN, network densification, spectrum optimization - Ericsson's new portfolio additions and Ericsson Radio System innovations provide a compelling way forward." To support new network builds, Ericsson has created the industry's first Industrialized Network Rollout Services solution. The Network Deployment Delivery Platform coupled with Ericsson's pioneering process facilitates the complete configuration, installation, integration, shakedown and handover of a fully verified site, ready in a single site visit. "Ericsson has driven innovation in every generation of mobile technology and now we are set to over-deliver on an aggressive promise. We are introducing the new hardware that 5G Plug-Ins, announced in June, will run on, so that the first operators can start to deploy 5G infrastructure. And, we are also launching innovations that improve both the performance and efficiency of today's networks using concepts that will evolve into 5G." 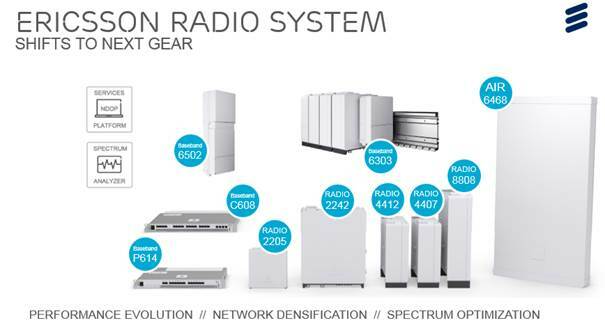 New radios, baseband variants, a software feature and a streamlined services platform will allow operators to shift to the next gear with Ericsson Radio System.